When news hit yesterday, that Tardar Sauce, better known as Grumpy Cat has allegedly raked in approximately $100 million, one could almost hear a chorus of barely employed twenty-somethings sighing, "Welp." Turns out $100 million was an inaccurate estimation, but let's be real. Grumpy Cat is definitely worth more than you and your silly college degree. Just over two years ago, Grumpy Cat made her spectacular debut on the big stage that is Reddit, inspiring laughter, tears, and endless memery. All because of her signature scowl. Well, after some corporate sponsorship (Friskies), a New York Times bestselling book, a Sesame Street appearance, a stint as a guest host on WWE Raw, that Lifetime movie, and her own brand of premium iced coffee (Jesus, what is wrong with us) among other accolades, the cat has racked up some serious money. Of course, some of this money has gone to Grumpy Cat's human companion, 28-year-old Tabatha Bundesen who was able to quit her job as a waitress in Arizona within days of the cat going viral and basically become Grumpy Cat's publicist and full-time personal assistant. It seems, if anyone is truly inspired by Grumpy Cat's rise to success, it's Grumpy Cat's owner—she told UK's Express that Grumpy cat is "unstoppable," saying, "What she's achieved in such a short time is unimaginable and absolutely mind-blowing. But while UK's Express claims that the cat has earned about £64 million (or roughly $100 million), Grumpy Cat's owner Tabatha Bundesen told Huffington Post that that number was "completely inaccurate." She declined to disclose Grumpy Cat's actual earnings, possibly because those earnings are entirely in the form of Friskies Party Mix Crunch Meow Luau bags and empty cardboard boxes (unconfirmed, but probably). If the $100 million estimation was correct, Grumpy Cat would have been worth more than Matthew McConaughey, Jennifer Lawrence, Morgan Freeman, and Tyra Banks (lol). 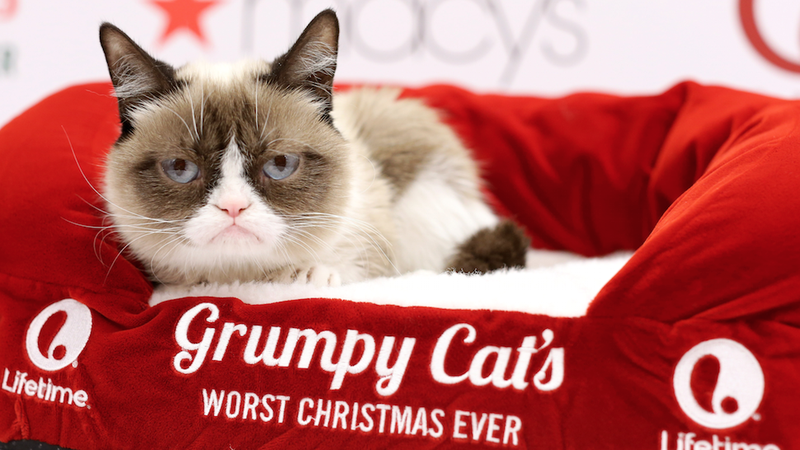 But we all know that Grumpy Cat is absolutely and unquestioningly worth more than all of us.